How to Remove DRM from Apple Music? Solved! As a loyal Apple Music fan, I have subscribed Apple Music streaming service so that I can download Apple Music songs for offline listening with the 'Make Available Offline' option. But I meet some obstacles when I transfer downloaded Apple Music to MP3 player due to DRM protection. How can I strip DRM from Apple Music so that I'm able to listen to Apple Music tracks anywhere? It's inconvenient to enjoy Apple Music with iPhone when doing exercises, such as running. Many users will try to switch downloaded Apple Music to some portable devices, like iPod Shuffle. 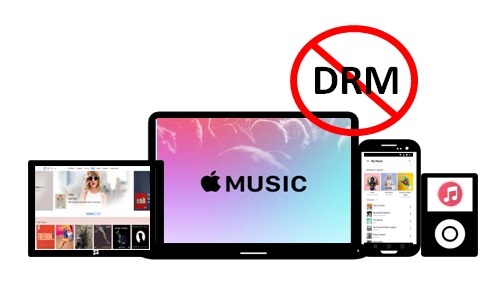 However, there is no way to make Apple Music song available for unauthorized music players as FairPlay DRM technology is built-in these music files, even if you have gotten Apple Music subscription. What you should do? Actually, the only tool you should equip with is an excellent Apple Music DRM removal solution that can remove DRM from Apple Music songs. With 40 million subscribers, Apple Music is the hottest streaming service, which allowing subscribers to access to Apple Music library of 'over 45 million songs' and download favorite music tracks to different platforms, including macOS, iOS, tvOS, watchOS, Windows and Android. But there are also a wide variety of devices that can't play them, like iPod Shuffle, Xbox One, Roku, etc. since songs and playlists downloaded from Apple Music are encrypted by FairPlay DRM copyright technology. What's more, when you cancel Apple Music subscription, all music streams will disappear from your library automatically. That’s to say, you don’t truly own downloaded Apple Music streams unless you have removed DRM from Apple Music songs. In order to make a full use of downloaded Apple Music, such as playing Apple Music on any device and player freely and keeping Apple Music permanently without paying subscription fee, we can meet AudFree Apple Music Converter, a professional Apple Music DRM remover. It is designed to remove DRM from Apple Music while converting streaming music M4P to MP3, AAC, WAV, FLAC, M4A, M4B, etc. As the fastest DRM removal software, this smart Apple Music Converter works at 30X faster speed without touching original audio files. All ID3 tags can be 100% preserved in converted DRM-free audio tracks. 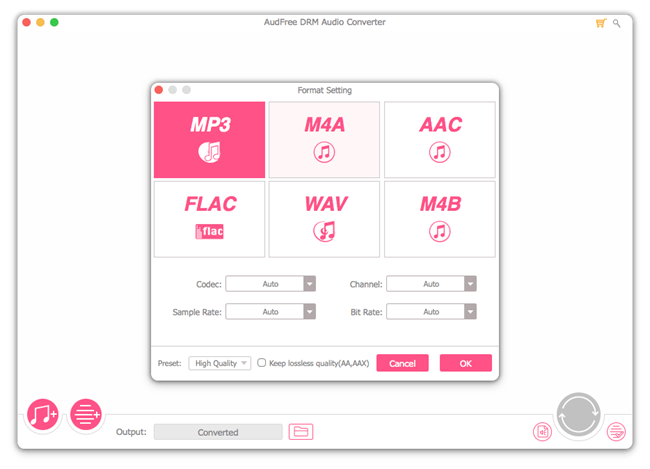 Convert Apple Music DRM M4P to MP3, WAV, FLAC, AAC, etc. With the easy-to-use interface, AudFree Apple Music DRM removal tool can disable DRM from M4P to MP3 or other unprotected audio formats with a few clicks. Please download and install the free trial version of AudFree on your computer and start to get rid of Apple Music DRM. Please be well noted the trail version can convert the first 1/3 content for each file. When you launch AudFree DRM Audio Converter from computer desktop, iTunes will be opened automatically. And then, you can click the first 'Add Files' button to choose favorite Apple Music songs from iTunes library. Or you can directly import downloaded Apple Music streams to AudFree conversion window. Note: Please make sure that you have downloaded Apple Music on your computer. And please authorize them to play on iTunes firstly and share the iTunes library with AudFree Audio Converter. Apple Music files are encoded in M4P format that can’t be compatible with many popular devices. Please click the 'audio' icon to open a new window, in which you can define output format as MP3, WAV, AAC, M4A, and more. And you can personalize the codec, sample rate, bit rate and audio channel as you like in this window. 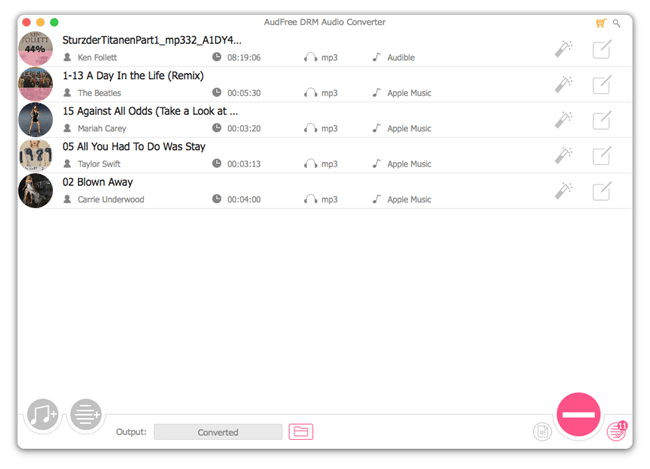 AudFree Apple Music Converter supports batch conversion to remove DRM from Apple Music songs. So you can import all music tracks that you'd like to unlock to AudFree. Once all settings are ok, please touch the 'Convert' button at the bottom-right corner of the main interface to start to remove DRM from M4P to MP3 with ease. After conversion, you can locate unprotected Apple Music on destination folder and transfer them to wanted devices for offline playback. When you have equipped with AudFree Apple Music DRM removal tool on your computer, removing DRM from Apple Music could be as easy as dragging and dropping. As a matter of fact, I have tried some other Apple Music DRM crackers that I discovered on Google before I wrote this tutorial. But compared to the conversion speed, output audio quality and other special features, AudFree Apple Music Converter could be the most effective tool for me to unlock Apple Music DRM. 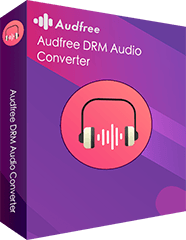 It's worth mentioning that AudFree Audio Converter can not only remove DRM from Apple Music songs, but also get rid of DRM from iTunes DRM M4P, M4A/M4B audiobooks and Audible AA/AAX audiobooks. Plus, it can also convert DRM protected audio files to other popular formats, like MP3. With the help of this extraordinary, you are able to listen to those DRM audios anywhere without limit. This video shows you one-by-one steps to remove DRM from Apple Music on Mac for playing unprotected Apple Music on any device and music player with the help of AudFree Apple Music Converter. Now, it's time for you to release your Apple Music from DRM lock. If there is anything you are confused, please leave your question in the common area. How to Get Apple Music Offline? Solved! Top 5 Best Apple Music Converter Review Play Apple Music on Amazon Echo? Fixed!